Spent Friday at the boat show, probably the best weather day of the weekend. Hung out at the Small Craft Advisor booth most of the day. Got to talk to lots of readers and potential subscibers. Karen Larsen from Good Old Boat stopped by to say hello, hadn't seen her for about three years. Traffic was typical Friday Annapolis boat show traffic, SLOW! Josh Colvin's wife, Anika, has a great new line of teas, salts and sugars in the booth next to SCA's, Old Salts. Proved very popular. 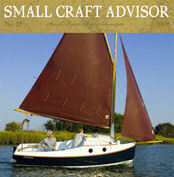 I'll be at the Small Craft Advisor booth at the sailboat show this Friday. Stop by if you go! Each year I do a calendar for CYOA (Columbia Yacht Owners Association). The pictures are sent in by members and I pick the best ones for use in the calendar. It is available in hard copy at: www.captnpauey.com. I also make it available for downloading (free) here, in either PDF or WORD format. Be warned, the PDF is BIG and your ISP may not allow you to download it. Enjoy! “Maintain and Improve Your Powerboat”: Capt’n Pauley’s new book is almost here! Capt’n Pauley’s latest book is due to be release by International Marine on July 17th. I’ve been working on this book for well over a year now. It is distilled from 100,000 words and over 300 drawings and pictures. Over 100 boat projects and upgrades. It will be on sale for $24.95. Look for an announcement when it is available. I just received this email concerning the death of Philip Bolger. Mr. Bolger is well known in home boat building circles but less well known in other boating venues. If you saw the film “Master and Commander”, you saw one of his designs. His design of an English warship, built as the HMS Rose, was drafted to star in the film. Mr. Bolger designed a surprising array of boats during his career. They range from off shore sportfisherman to Maine lobster boats. Later in his career, he specialized in smaller boats designed for homebuilders, often called “Bolger Boxes”. They were built by an amazing variety of people and have sailed and powered all over the world. IV antibiotics but things are definitely improving. I hope to get back to regular posting with this message. Now that I'm out of the hospital and somewhat "back in the saddle", I've decided to make a few changes to The Virtual Boatyard. A fair number of the latest posts were humor related, not boat related, simply because that was what I loaded up for publishing before unexpectedly going to the hospital. I've decided to cut back on the humor and get back, soon, to making more boat related posts. As a result. I've started a second blog for Purgatory Cove, www.purgatorycove.com. Those wanting to see the latest news from Purgatory Cove Fish Dock & Marina are welcome to visit that blog. As of today, I'm not posting any more of their letters here. I am working on more boat related conents and will be posting it soon. Astute observers of this blog site will have noticed a dearth of real, live blogs from me lately. Sorry to say, I’ve been laid up and not posting for the last month or so. Not to belabor the point, but an errant blood clot and a vascular procedure gone awry resulted in a cascading set of health issues. I’m out of the hospital now but home-bound. Tied to a wound vac (Google that little puppy!) and fighting anemia, I am never-the-less on the mend. I hope to be back blogging on a more regular basis now I can at least get to the computer! Hang in there, more blogging and boating content is coming! BoatTEST.com and The Virtual Boatyard Link Up! BoatTEST.com (www.boatTEST.com) is the premier site for test reports on powerboats of all types. Their web site provides test and video reports and evaluations of literally hundreds of powerboats, ranging from PWCs up to mega-yachts. If you are thinking of buying a boat, they more likely than not have an online review of it, often including video. Welcome to Capt’n Pauley’s Place! Before we get started, how about some introductions? I’m Paul Esterle, a boating writer, book author and editor. I am currently Technical Editor of Small Craft Advisor magazine and Managing Editor of Nor’easter magazine. I’ve finished one book, “Capt’n Pauley’s Boat Repairs & Upgrades” and have a second, “Maintaining and Improving Your Powerboat” due out in July of 2009.